This is a 2m 50 micron fiber optic mode conditioning patch cable. 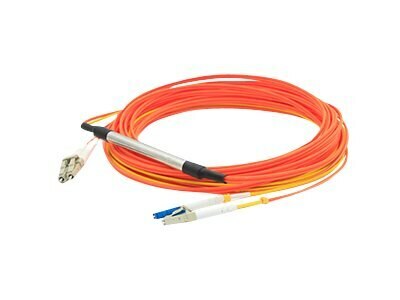 This cable is a duplex multi-mode cable with a short segment of single mode fiber at the transmitting end. Specifically, it includes a 2 x LC 50/125 micron to 1 x LC 50/125 & 1 x LC 9/125 micron cable. The mode conditioning patch cable uses an offset splicing coupler, coupling the single mode fiber to the multi-mode section of the cable. The offset occurs from the center of the multi-mode fiber. Our fiber mode patch cables are to be used with LX, or longwave, gigabit ethernet transceivers that use both SM and MM fibers. With normal multi-mode patch cables, the transceivers can generate multiple signals causing differential mode delay (DMD), severely limiting transimission distances. Our fiber mode conditioning cables remove these multiple signals, eliminating problems at the receiver end. These cables are recommended for multi-mode cable runs greater than 50 feet. The fiber mode conditioning patch cables are 100% compliant for all of your networking needs. They are compliant with IEEE 802.3z and provide low insertion loss. The patch cables are 100% compliant for all of your networking needs. The products are guaranteed by federal law to not affect or void OEM warranties.